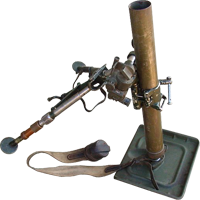 The U.S. Army M2 60mm mortar consisted of three main components; the tube (12.8 pounds), the bipod (16.4 pounds) and the baseplate (12.8 pounds). Mortars are designed as close support weapons for infantryman. The M2 design, the standard for the Army and Marine Corps, was based on a French design from the Brandt company. 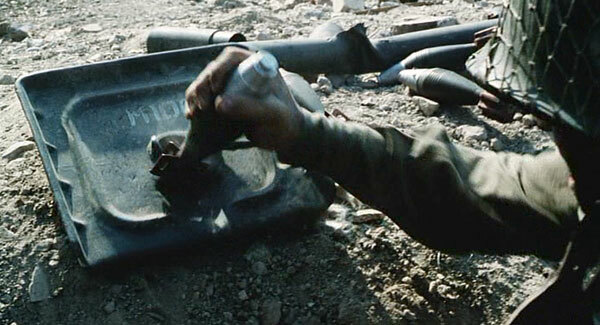 The M2 fired three standard rounds; high explosive (HE), smoke, and illuminating rounds. The paratroopers who were defending the bridge at Ramelle were outfitted with an M2 60mm mortar until it was destroyed by German artillery fire. 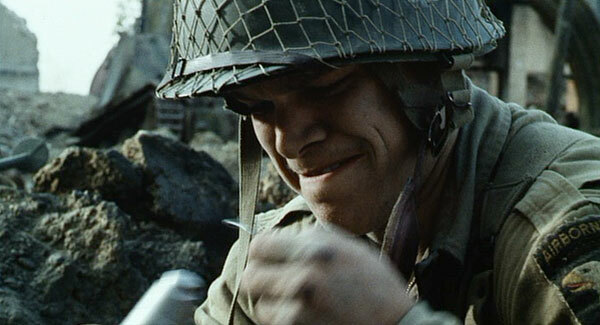 All that was left were the mortar rounds, which were used by Captain Miller and Private Ryan as makeshift grenades. 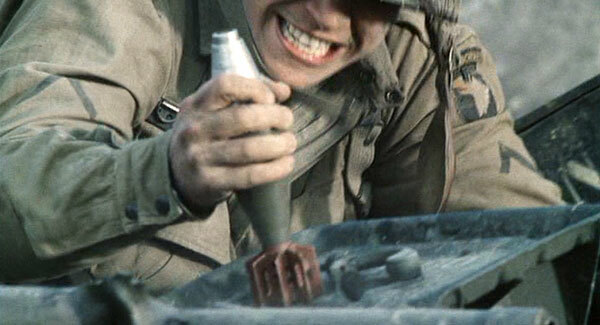 After removing the fuse arming wire, the mortar rounds were banged hard on a mortar baseplate (activating the fuse) and then thrown toward the advancing Germans. 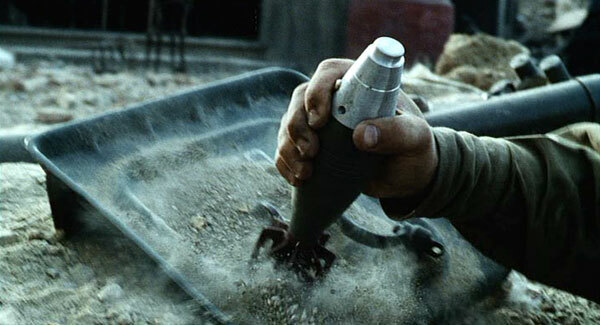 Although Miller and Ryan seemed to have had 100% success with this method, in reality the mortar rounds would have had to have impacted on their igniter heads in order to explode properly. 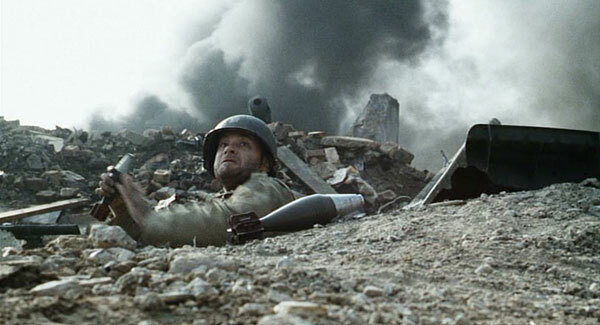 A close look at the mortar-throwing scene shows that Tom Hanks and Matt Damon are usually going through the motions of throwing the rounds, but they are not actually throwing anything. 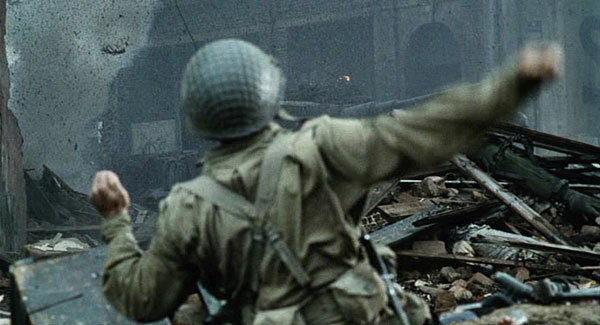 It would have been difficult to time the positions of stuntman with the throwing of visible rounds and the resulting explosions, so a little bit of creative suggestion is usedthe camera arcs to follow the expected path of the round, even though nothing is actually visible on screen. 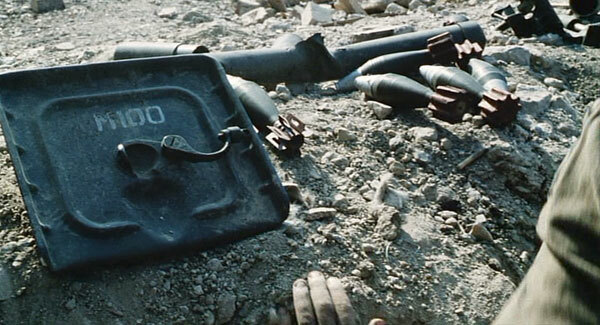 In an excellent nod to continuity, a wrecked mortar tube can be seen (see screen shots 2 and 3) lying amidst the mortar rounds.